Pablo Neruda: Mga Piling Tula edited by Virgilio Almario and Romulo Baquiran, Jr.
edited by Virgilio Almario and Romulo P. Baquiran, Jr.
Pablo Neruda: Mga Piling Tula is a collection of the great poet’s works translated into Filipino. 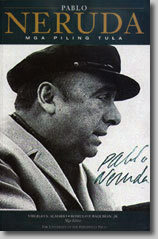 Pablo Neruda is one of the most popular poets of the 20 th century. He published his first book when he was twenty and a year after published Veinte poemas de amor y una cancion desesperada—the book that brought him into the ranks of the great Spanish poets. He was awarded the Nobel Prize in 1971. The book was edited by National Artist for Literature Virgilio S. Almario, currently the Dean of the College of Arts and Letters in UP Diliman, and Romulo Baquiran, who has won the National Book Award and the Manila Critics Circle Award.